Sir. 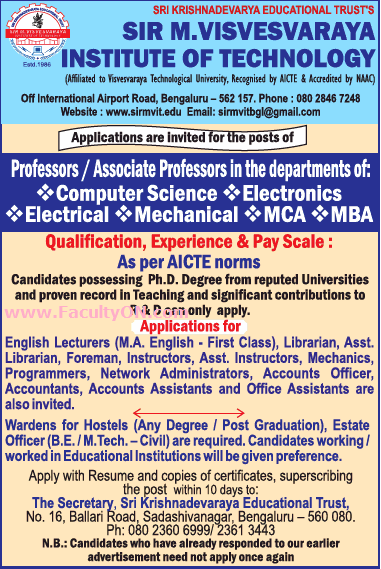 M. Visvesvaraya Institute of Technology, Bangalore has advertised in THE TIMES OF INDIA newspaper for recruitment of Associate Professor / Assistant Professor / Lecturers Plus Non-Faculty jobs vacancies. Interested and eligible job aspirants are requested to apply within 10 days from 01st August 2018. Check out further more details below. About College: Sir M Visvesvaraya Institute of Technology (Sir MVIT) is an Institute of repute in the state of Karnataka (founded by Sri Krishnadevaraya Educational Trust in 1986). The institute offers nine B.E. degree programs in Civil, Mechanical, Electrical & Electronics, Electronics & Communication, Computer Science & Engg., Industrial Engineering & Management, Telecommunication, Information Science and Bio Technology and four Masters Programs in Computer Applications, Business Administration, Computer Integrated Manufacturing and Electronics. How to Apply: Interested candidates are requested to send their application along with updated CV and copies of certificates to the postal address of the college given below. Also superscribe the envelope of the application with the post applied for.